1920s toaster, made by Landers, Frary & Clark. Photo via the Cyber Toaster Museum. We ran across this photo of a 1920s toaster the other day. Isn't it lovely? We were immediately struck by the artistry and thought that went into designing an appliance that we 21st-century folks tend to consider rather boring and utilitarian. 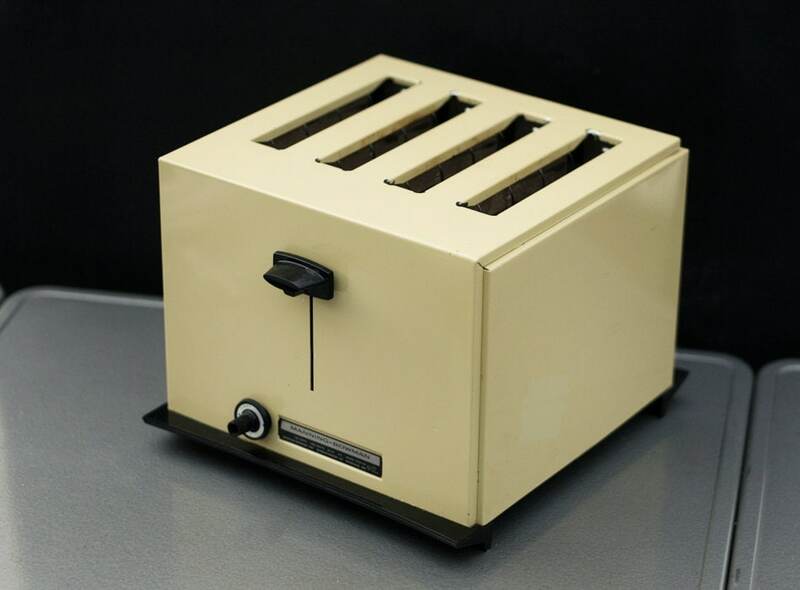 Naturally, we started wondering what other interesting toaster designs were out there. It turned out to be a pretty interesting trail to follow -- starting chronologically with old-school toast-your-bread-over-the-fire designs, followed by simple stovetop racks, and finally to the early electric models that evolved into what we think of today as the standard pop-up kitchen toaster. Below, you'll find a quick sampling of what we found. Which one is your favorite? 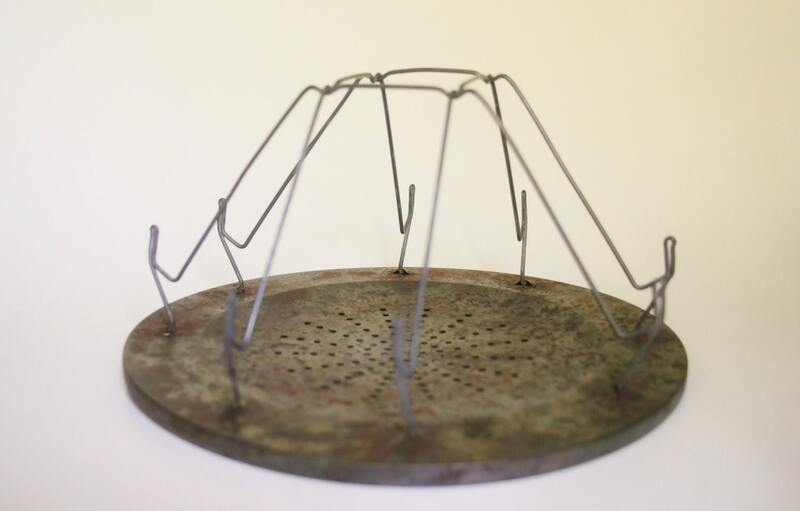 1800s French wire toaster, for use over a fire. Via MyFrenchAntiqueShop on Etsy. 18th century wrought iron toasting iron, for use at the hearth. Note the fleur-de-lis design, which would leave a decorative imprint on bread after it was toasted. Photo (c) Pocumtuck Valley Memorial Association, Deerfield MA, via the Memorial Hall Museum Online. 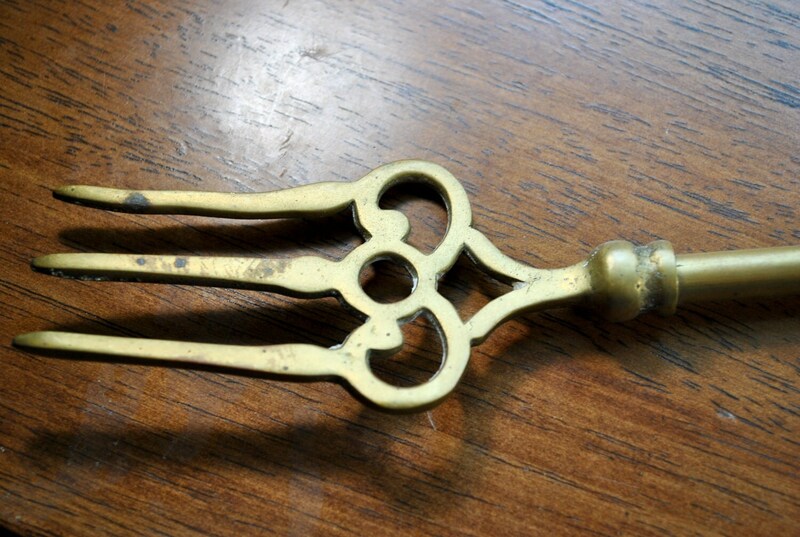 Antique brass bread toaster fork with decorative elephant handle. Perhaps the easiest to operate of all the old "toasters" shown here. Just stab a piece of bread & hold it over the fire. Et voila - toast! Via Whosits & Whatnots on Etsy. 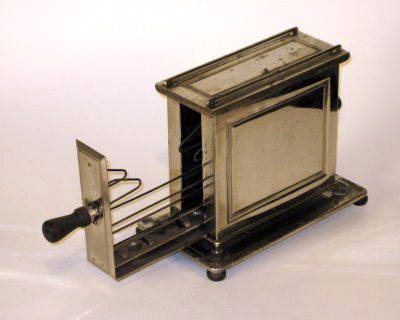 Side-loading nickel-plated toaster, c. 1910s. Made by Landers, Frary & Clark. Via the Cyber Toaster Museum. 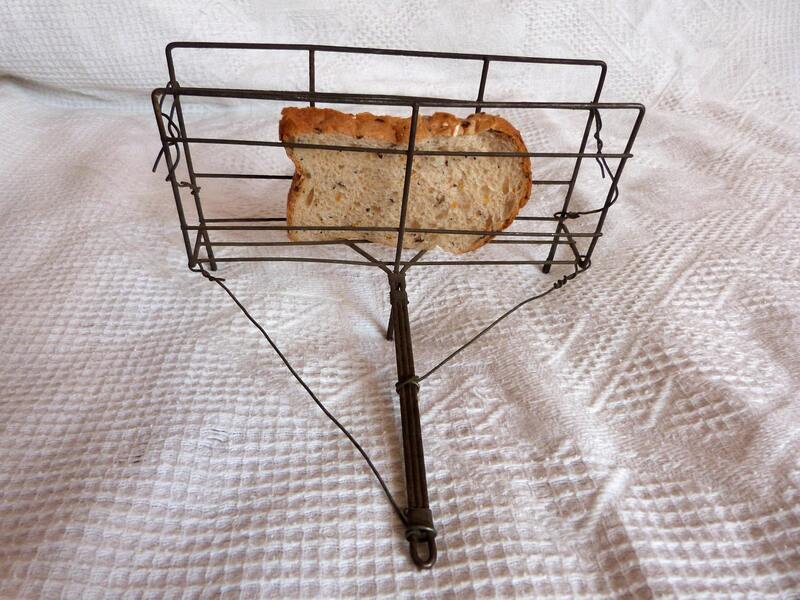 Stovetop wire toaster rack. These oldies but goodies still work great if you have a gas stovetop - just make sure you keep an eye on your bread to make sure it doesn't go right past "toast" and straight into "burnt"! Via Vintage By Lynn Ann on Etsy. 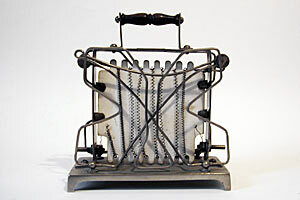 Adacrisp wire door toaster, made with nickel-plated metal and wood. Pre-1920, France. Via ToasterMuseum.com. Flopper toaster made by Bersted Manufacturing. Via the Cyber Toaster Museum. Blue Willow Toastrite electric toaster, decorated china, 1920s. Made by Pan Electric of Cleveland, Ohio. Vulcan ceramic and Bakelite toaster. c. 1930-1940, made in Australia. Via Collectors' Quest. Manning-Bowman four slice pop-up toaster, c. 1950s-1960s. Via Shopasta on Etsy. I love this post! This is the coolest collection of toasters I've ever seen and the fact that you went out and found them shows what a great sense of creativity you have! It reminds me of one of the worst Christmas presents I ever bought my wife. I bought her a toaster, but it was a really nice toaster! It cost me like $400 at Williams-Sonoma. I was in the double dog-house because A) I bought her a toaster. and B) I paid $400 for a toaster when you can buy a decent one for $40! She took it back. One of my more memorable crash and burns. Thanks for sharing your link at Etsypreneur. Tim - thanks for commenting, and sharing that great Christmas story. It's nice to see that you have a good sense of humor about it -- hopefully your wife looks back on it and laughs, too! This is a push to put limitations on developing thoughts of beauty cause now and again a few puzzles Christy Turlington Face Cream ought to never be unfurl and a few answers ought to never be told for as much as we deny it.